The Couplerbox is a combination of the Startabox perforated case assembly and rebar coupler system, in a single unit. It has been developed to offer a rebar continuity system for larger bar diameters and where a high concentration of reinforcement or other factors prohibit the use of a rebend system, such as Startabox. The unit is cast into the first concrete pour to provide threaded connections to the subsequent, adjoining concrete pour. When in use and once the lid is removed, a very neat and keyed joint is produced, requiring no need for scabbling, retarders or jetwashing of the joint. As the Couplerbox is produced in a factory environment, the coupled bars are at the correct bar centres specified and not subject to errors on site. The system was initially developed to offer a reinforcement continuity product for the areas where a rebend system was being specified, but in a larger bar diameter than possible to produce. 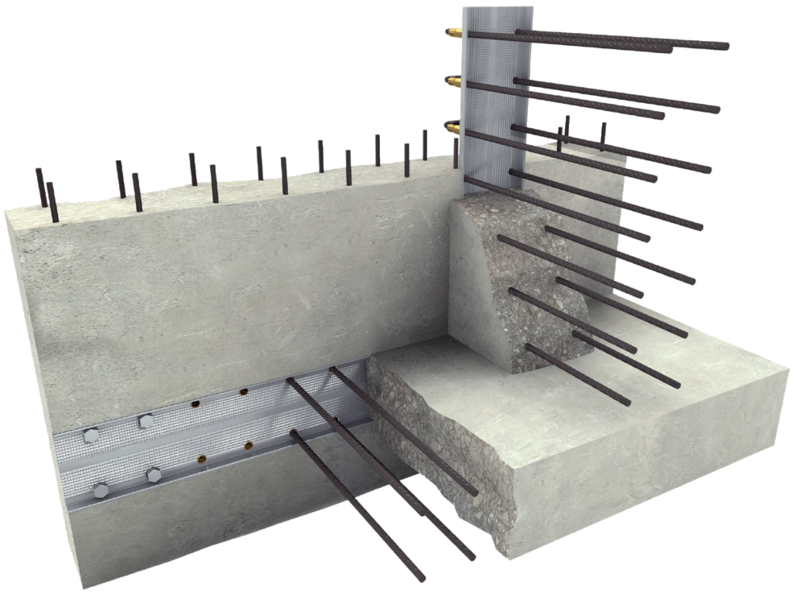 Without the requirement to rebend reinforcing bar, diameters of up to 32mm rebar can be produced in the Couplerbox system. The Couplerbox system has been further introduced to solve the problem of locating rows of individual coupled bars especially with the use of some types of moving formwork systems such as slipform rigs. Coupled bars can become easily displaced and slip back from the concrete surface making location and preparation for future use a time-consuming and costly process, requiring the use of mechanical equipment in a difficult environment. If coupled bars cannot be located, rectification works can be required. The introduction of the Eurocode 2 building regulations has now seen a requirement for much longer lap lengths, making the use of couplers more economical and restricting the manufacturing possibilities of rebend continuity systems. Assembled in a factory environment reducing possible fixing errors on site A lower unit weight compared to a rebend system. No lost couplers due to movement in concrete pours. Allows for shorter production units than possible in a rebend system. Threads of female couplers are fully protected until required for use. Perforated casing negates the need for any further joint preparation. Aids reduced fixing time when compared to the fitting of individual coupled bars. Provides a solution where larger diameters over 16mm are required. Perforated casing offers improved shear connection. Ensures no protruding bars until immediately required. Minimises any potential remedial works on site. Minimises any potential remedial works on site. Couplerbox can be easily stripped ready for use.